I joined Bradleys in May 2017 in the Customer Services Department shortly after I had graduated. This enabled me to develop my confidence and knowledge in the business and as a result I discovered it was an industry I love. In November 2018 I was given the opportunity to move to the Exeter North Street office to broaden my knowledge and progress my career, this is something Bradleys have always supported me with. 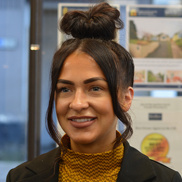 Working in the branch has allowed me to understand all roles within the company and focus on the first hand sales and lettings experience, from meeting the clients to showing them around a property and negotiating a sale or let, it’s really rewarding. I am looking forward to a long career with Bradleys. In my spare time I enjoy catching up with friends, keeping fit and of course… shopping!